This is the best chocolate pie recipe I’ve ever tasted. Bar none. My family has been baking it for years. It’s soooo good, and it’s soooo easy to make. Like ridiculously easy. Really, the hardest part is stopping yourself from eating another slice, or the whole pie. This pie is ALWAYS made for Thanksgiving with my family. This is a great recipe to throw together quickly with a store-bought, pre-made pie crust if you’re in a hurry. 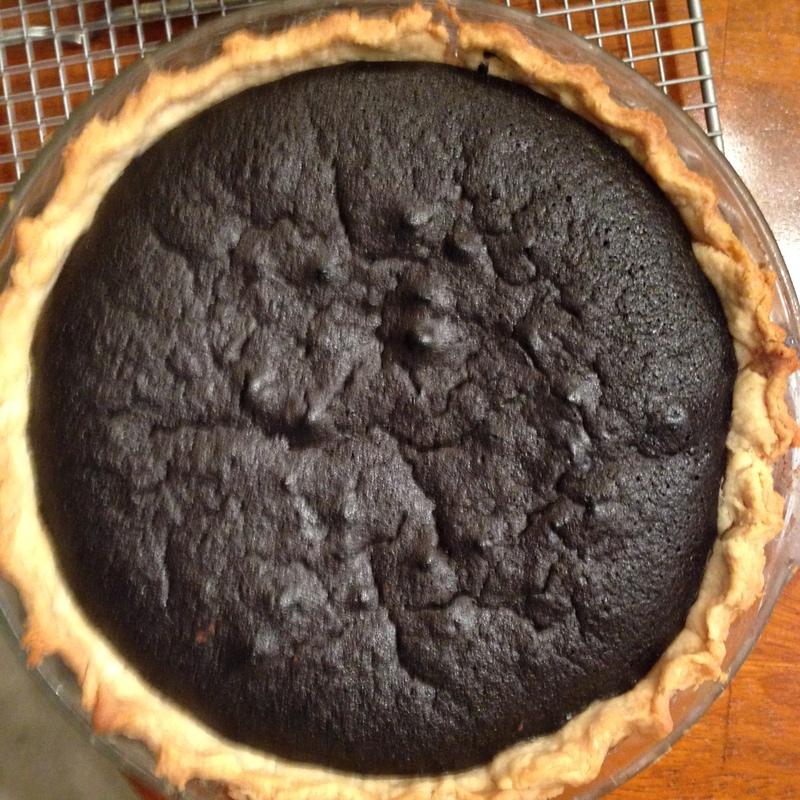 I like to make my own pie crust, though, and for this pie, I decided to try out a graham cracker crust. While it was very good (my wife and BIL loved it), I think I prefer this pie with a regular pie crust. It definitely brought a different element, which may have been the brown sugar that added a toffee-like taste. Maybe I’d have a different reaction if I used white sugar next time. 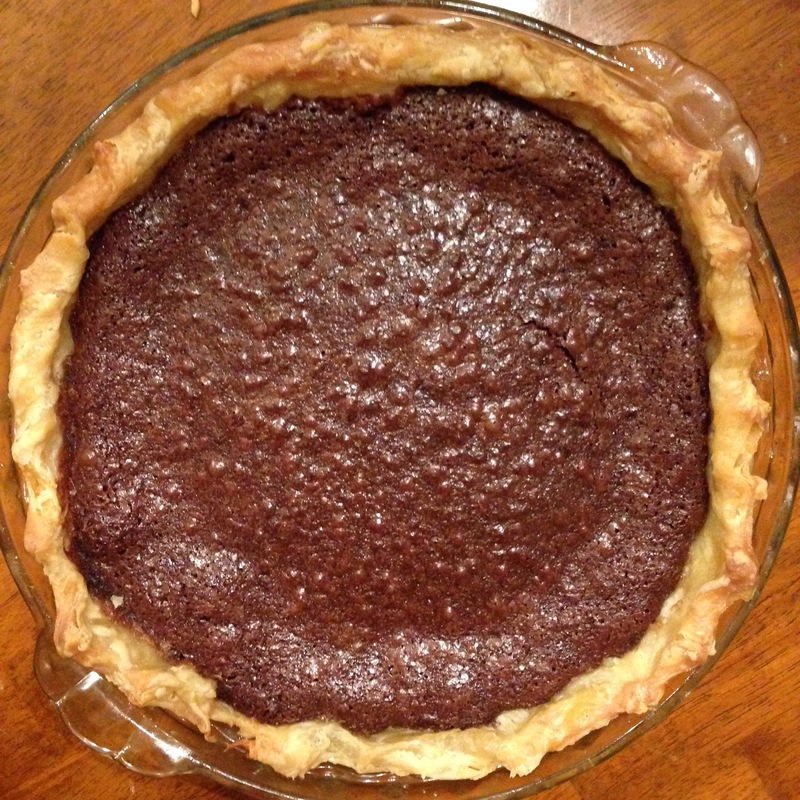 UPDATE (11/26/15): Here is another picture of the Chocolate Pie with a normal pie crust. It was slightly under baked in the center, as you can kind of see in the photo. It is virtually impossible to ruin this pie, whether it is over- or under-baked, so don’t worry. Based on a recipe found in this book. Preheat over to 325 degrees. Make the pie crust by processing the graham crackers. Pulse in the brown sugar to break up any clumps and add the salt. Melt butter, then mix it into the graham cracker crumbs. Press buttered mixture into a pie plate. Chill in refrigerator for 15-30 minutes, then bake for 10 minutes (as you prepare the filling). In a medium saucepan, melt the butter and chocolate over low heat, stirring occasionally until melted. Remove from heat to cool. Whisk flour, sugar, and salt in a large bowl. Mix cooled chocolate/butter mixture into flour/sugar mixture, then add vanilla until well blended. Gently fold in lightly beaten eggs until just incorporated. Pour into pie crust. Bake 30-35 minutes (it may appear uncooked, but don’t overbake it). Transfer to a wire rack to cool completely. To make whipped cream, whip the heavy cream with an electric mixer on medium speed in a bowl until stiff peaks form. Add the vanilla bean paste and powdered sugar, mixing until blended. Refrigerate until the pie is served. Serve the pie at room temperature or chilled in the fridge, as desired.